Two second-half goals were enough for Arsenal to take all three points from Cardiff City at the Emirates. It was a dour and dull first half at the Emirates as Cardiff City dominated much of the opening 45 minutes. The Gunners just couldn’t break the visitors down as Cardiff sat back and soaked up the pressure. That continued well into the second half until substitute Alex Iwobi burst into life and played a pass through for Sead Kolasinac. The Bosnian was brought down and Pierre-Emerick Aubameynag stepped up to score the penalty. 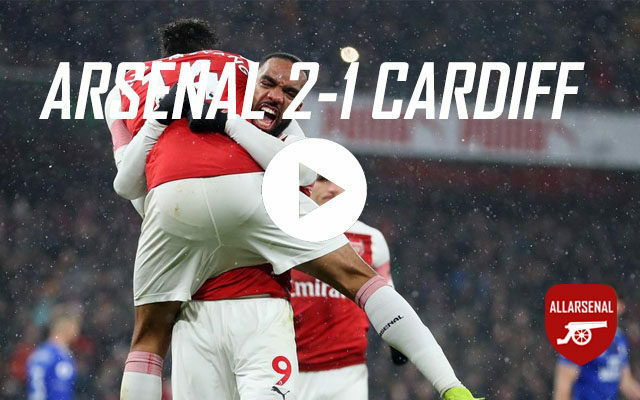 Arsenal pushed forward in search of the deciding goal and they got their reward when Alexandre Lacazette went on a mazy run down the right before finding the far corner of the net. There was, however, a sting in the tail for the visitors as Nathaniel Mendez-Laing curled one past Bernd Leno but it was too little, too late.